A healthy heart beats around 100,000 times a day. The heart’s job is to supply the body with oxygen-rich blood. The heart has four chambers. Blood is pumped through the four chambers with the help of four heart valves. 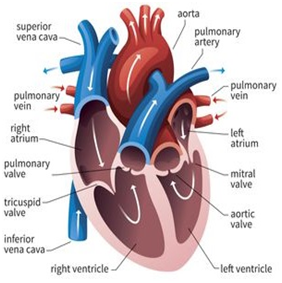 Heart valves open when the heart pumps to allow blood to flow. They close quickly between heartbeats to make sure blood does not flow backward. Any trouble in this normal flow pattern will make it hard for the heart to pump the blood where it needs to go. Pulmonic Valve: Controls the flow of blood to the lungs to get oxygen. Aortic Valve: Controls the flow of blood as it exits the heart and is pumped to the rest of the body. 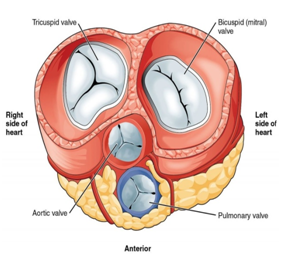 Mitral and Tricuspid Valves: Control blood flow as it moves between the chambers of the heart. Regurgitation (leakage of the valve): The valve does not fully close, causing blood to flow backward. This forces the heart to pump more blood on the next beat, making it work harder. Stenosis (narrowing of the valve): The opening of the valve narrows, limiting the flow of blood out of the heart’s chambers. This causes the heart to pump blood with increased force in order to move blood through the narrowed or stiff (stenotic) valve. Many surgical techniques are available to repair the mitral valve to enable it to open and shut efficiently. A damaged mitral valve can be replaced with either a mechanical valve, or a biological valve. Mechanical valves are made of durable synthetic materials such as titanium and pyrolytic carbon. They last approximately 30 years, and recipients must take lifelong blood thinning medications (e.g., Coumadin or Warfarin). A mechanical valve is typically recommended for individuals 50 years or younger. Biological valves are made from animal tissue (cow or pig). They last approximately 10 to 15 years, and patients do not require long-term blood thinning medications. A biological valve is recommended for those 65 or 70 and older. Several surgical techniques are available to tighten or loosen the aortic valve, so that the valve functions properly. Aortic valve repair can include surgical valvuloplasty to repair valve cusps so that it opens and closes more effectively. With aortic valve replacement surgery, the faulty valve is removed and replaced with an artificial valve. The decision to choose a mechanical or biological aortic valve depends on the unique needs of each patient. Many people with severe mitral valve regurgitation may not have symptoms, yet may still benefit from early mitral valve repair.